Are unused downloads from subscriptions accumulated for following months? The answer is yes. 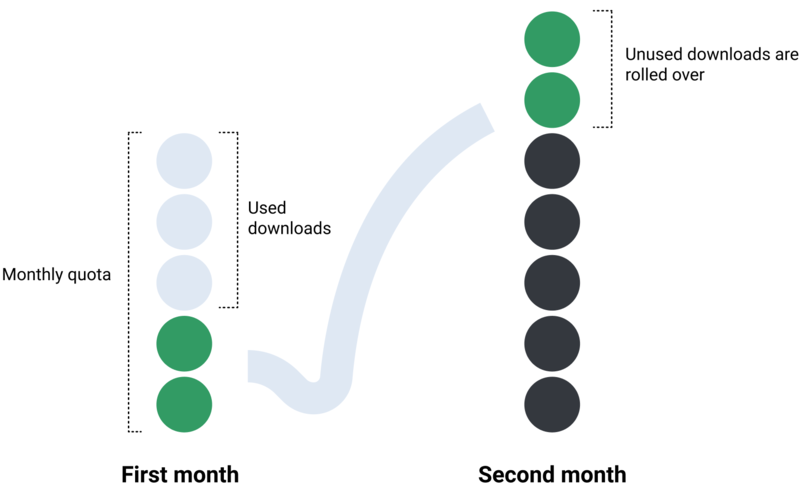 If you have not used all the available downloads in a month, then you don’t need to worry about losing them. They will be passed to the following month, so you can use them later when you are in need of icons again. Specifically, in the case of Pro Micro, you can roll over up to 60 downloads. And, in the case of Pro Starter, you can roll over up to 300 downloads. If you are on the Pro Micro plan and you have only used 4 downloads out of 10 this month, then you can roll over the 6 unused downloads, as an example. Next month, you will have 16 icons available in your account. If you didn’t use these 16 download either, then, the next month you will have 26 downloads at your disposal. You can continue rolling over up to 60 downloads in the case of Pro Micro. This maximum roll-over means that you will still keep the 60 downloads for next month, but you cannot have more than that. If you cancel, all your accumulated downloads will expire. ❗ Note: If you cancel your subscription, the accumulated downloads will expire at the same time as your subscription expires. The expiration will thus happen when your subscription is due, which is the last day you have paid for. Read more about How the Pro Micro subscription plan works and How the Pro Starter subscription plan works.